Now it’s not often that either Franca or myself like to use the pictures of others, but when the place we’re trying to talk about fills the both of us with so many fantastic thoughts and desires to return, we couldn’t help but decide that everyone must know about the fantastic location of the Chichu Art Museum and the incredible architecture it is and the stunning art it contains. Possible as a day trip out from Osaka via a train and a ferry to, the island of Naoshima is a remarkable island with an even more remarkable backstory. 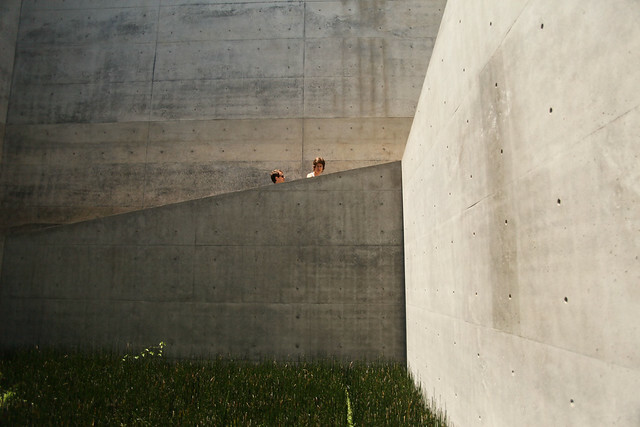 Under the guidance of stellar architect Tadao Ando, the first Naoshima International Camp was held on the island in 1985 as the joint brainchild of publisher Tetsuhiko Fukutake and then mayor of the island, Chikatsugu Miyake. 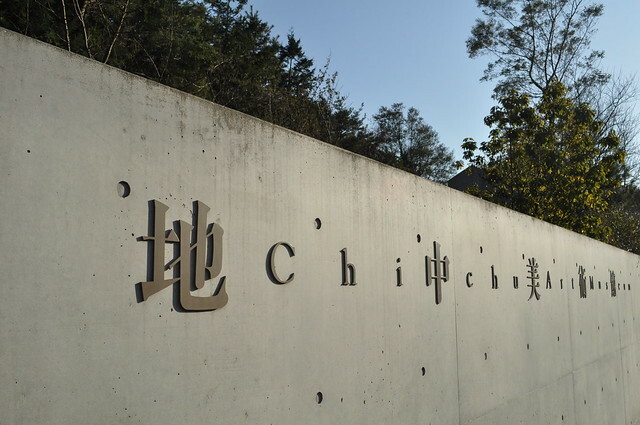 They aimed to developed the south side of the sleepy fishing island into the beginning of a new chapter of international and local creative interest and education for the people of the local area and for the wider Japanese populous. 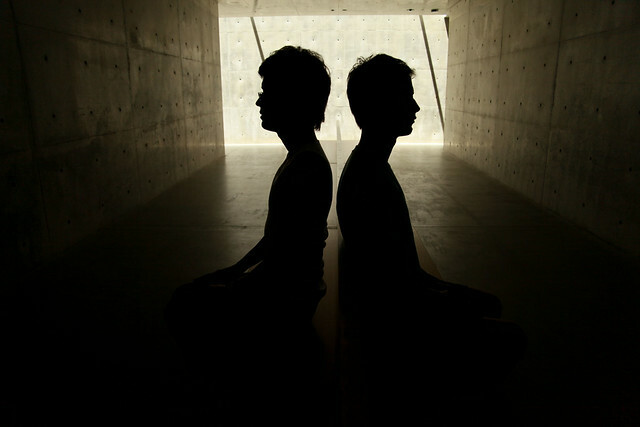 After continued work over the past 28 years, the brainchild has grown into an adolescence as Benesse Art Site Naoshima, a number of art projects and buildings across the island – and also now incorporating a couple of local islands – including a specially designed art hotel complex. 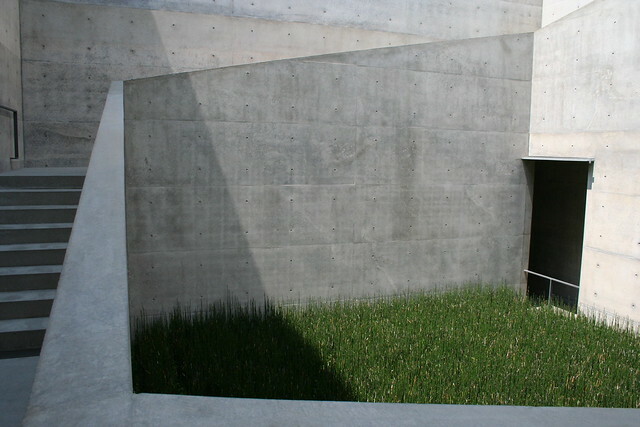 The apple of our eyes in particular, the Chichu Art Museum is a sunken complex of plain concrete rooms which contain as a small in size but enormous in prestige international collection comprising of works by Claude Monet, Walter De Maria and light visual artist (and huge favourite of ours) James Turrell. 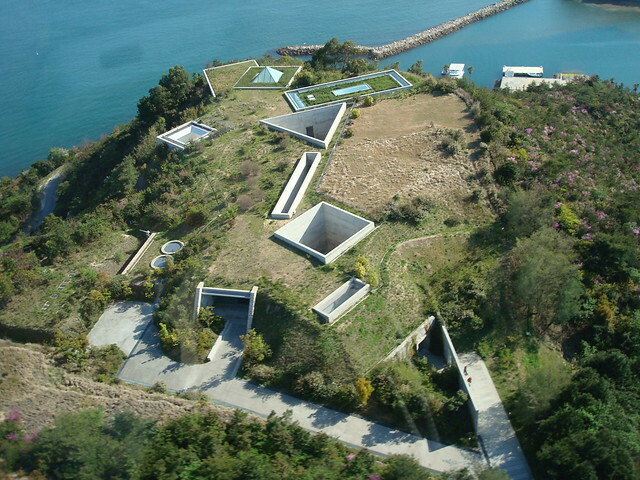 Dug deep into the hills and cliffs that are scattered across the coastline, the structures are surrounded on all sides by nothing but soil and the plantation that grows on it that – combined with the depth in which the building goes – allows only the open roof to permit in the sun giving it a quiet, bright, yet somber and peaceful atmosphere. The surrounding concrete walls of the corridors and connecting rooms are left plain, without plaster or paint and smooth to the touch, almost as if they’ve always been there, crafted for some higher purpose and similar in style to the modernist buildings of Brasilia or the plain emotionless buildings of some utopian future more likely to be found in Orwell’s 1984 . It’s an incredible feeling being left to wonder throughout the complex with no distractions and only the feelings the building brings out of you as you step from the shadows to the light again and back. I felt and thought about nothing else but creativity and the thought that humanity is capable of crafting something clinical and perfect by combining natures elements whilst addressing and including natures ability to shine or grow and be apart of it, maybe even claiming those elements back. 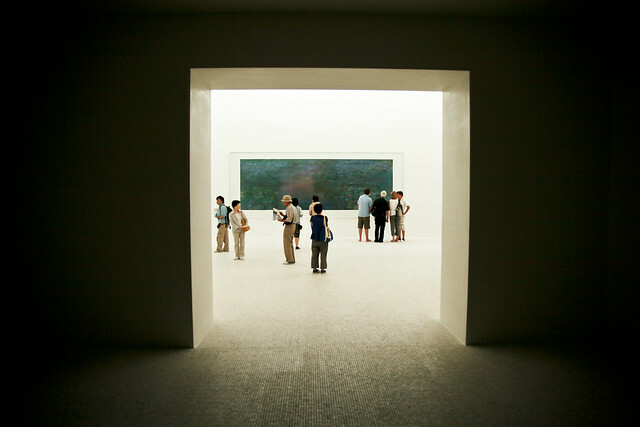 As you approach the Monet room, you enter the white light and familiar white walled surroundings of an art museum, but whilst anywhere else you might settle into the regular routine of pacing back and forth from room to room of any other famous art museum – like Rome’s Maxxi for instance – at Chichu Art Museum things carry on just as unusually as the building itself as you’re asked to remove your shoes and to wear some provided slippers so as not to make the perfectly white floor. The Monet pieces displayed are simply magnificent and it’s not hard to see why such magnificence is protected and simplified to a basic white room without the sounds of cameras of the clicking of heels as people wander back and forth. In fact, considering you’re in the room with work of one of the worlds most celebrated artists, it’s surprising to find yourself with only a handful of fellow voyeurs present, if not entirely alone. At one point I was entirely alone just for a few moments with nothing but these great pieces and my thoughts for company. A truly exhilarating experience. 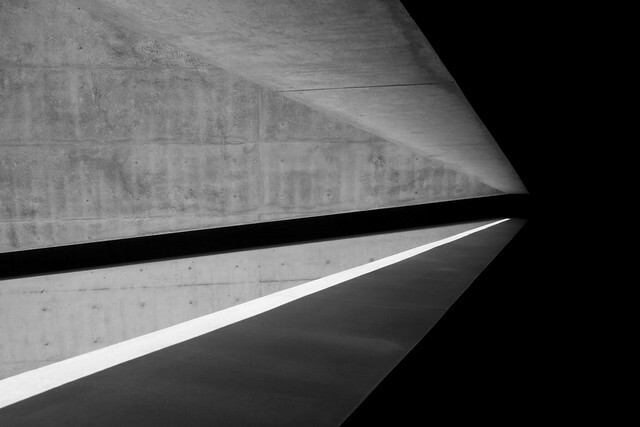 The James Turrell work is also fascinating, and much like his work that we found elsewhere on the island, is best seen rather than described or photographed, so even if I had a picture for his pieces here I think I’d choose to not post them. 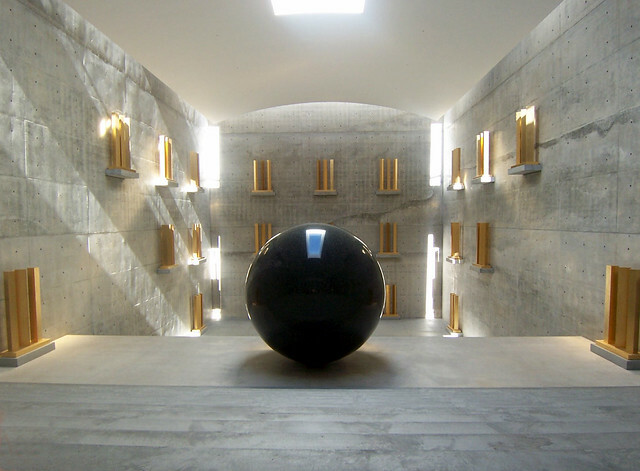 As for the work of American Walter De Maria, it’s an astonishing again to find yourself almost alone in a large room filled with sculptures of granite, mahogany, gold leaf and concrete. 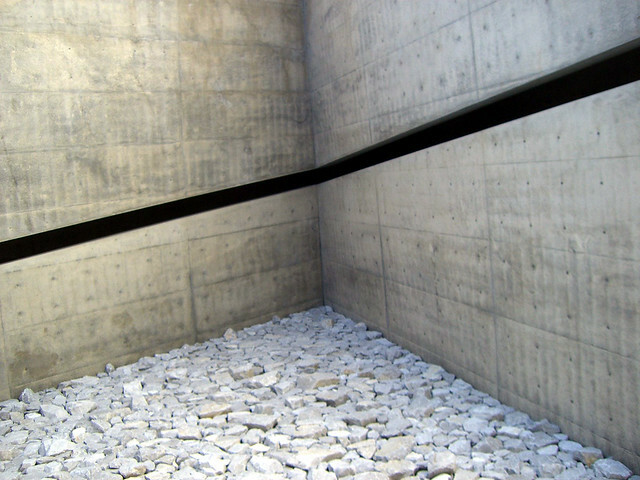 This 2004 piece entitled “Time / Timeless / No Time” is a walkthrough and touchable experience and whilst there we were invited to not only touch the large, dark and reflective sphere that sits as a centrepiece to the space, we were also encouraged to push it in a hope of pushing it down the stairs. One part ‘World’s Strongest Man’, another part the legend of the sword in the stone, we didn’t manage to move it an inch. Whilst the price may be quite a contrast to the price of some of the leading art museums in other parts of the Western world, we both feel that given the unique location, the magnificence of the thought and design behind the incredible architecture, the thoughts paid towards incorporating nature and natural sunlight and shadow and the splendor of having such great pieces of art to enjoy – almost solemnly as if the Chichu Art Museum was a temple or church to great art – makes the price entirely worthwhile. It’s certainly not the budget location that we would have used our time to visit, but we’re both incredibly glad that we took a chance and broke the bank and our budget for Japan to see what the island had to offer. Just bare in mind that it may be an expensive day trip to see all that the museum has to offer, but it’ll be an experience you’ll never forget – and like us – you’ll be longing to return. Do you want to go beneath the soil to see these sights? Your description of the museum as a “temple or church to great art” seems perfectly fitting for a space that appears designed to inspire both creativity and contemplation. Thank you for sharing the experience and the images of the gallery – beautiful! I’m glad you liked the look and sound of the museum and I’m happy that I can in some way help people to learn a little something about the museum, but it’s never the same as being there and experiencing it. You must go there some day with Bret! What an amazing looking place. So many dramatic spaces. Would love to visit sometime. If you ever get the chance, James, you really must. There’s even more to see on the island and all of it is tremendous. This looks so spectacular! Putting this on my ‘need to visit’-list right now 🙂 It looks like my dream house hooked up with a hobbit house and they had a baby. Honestly, it might be too bare and minimal for some, but this place was truly one of the highlights of our time in Japan.